A Hipscore "study" has been conducted on very few dogs, seeing that the Barbet dog population in the UK is around 20, or less. In France, not ever.It would be nice to have one. Hips:The French Barbet club has never done any type of study on the hips of the Barbet, nor any average hipscore. The French club has not recently published a list of Hipscores for French born population. The breeder is solely responsible for a Barbet owner to ask for hipscore to be done. Eyes: Once a study was done in 2005 on PRA,conclusions were in a Bulletin, that year. Entropia or entropion were never discussed. That condition is not good for hunting dogs for obvious reasons. The French club has not recently communicated on that point. A study is being run on the "Barbet" in Finland which has just about anihilated people's desire to have a pup in some countries, due to the negative propaganda and enuendos. The Golden Retriever and Labrador also suffer from epilepsy. It is very common among dogs. Most breeders are concerned to produce "healthy" dogs. Healthy also means "healthy" character according to the standard. There are no Barbet "puppy mills" as the breed is too rare to mass produce, due to not enough males being confirmed. There are aggressive Barbets. As in any breed. Grooming:Keeping in mind that there are different "bloodlines" that will produce different looking dogs, some typed Poodle, some Spanish water dog and of course some Barbet,the grooming will be according to what comes out as in a litter for a couple of generations, just about anything can come out. Grooming can be herrendous depending on bloodlines. Others are quite easy. A Griffon is not a difficult type to groom. For obvious reasons as it has historically has been a Gundog= easy grooming. I don't know if a real lifespan can be determined by people who have not been breeding long enough for dogs to die of old age.I cannot. Several have died at age 8. The lifespan of a couch potato will vary from a hunting dog. 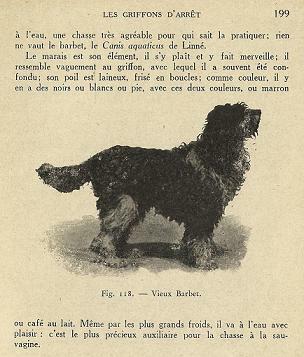 The French breed club is the only club to detain what little information about the past of the Barbet. No other club in the world detains that info. Information in other countris has been compiled and most likely sent to the French Club. Since there is not a lot of cummunication between breeders or clubs, it is not easy to go forward. Hence, the slow development of the breed and its tremendous heterogeneity. There is no international breeding plan. A few breeders here and there communicate only according to what "friendships" they have. I do invite any person interested in the breed to go see as many Barbets as possible, talk to breeders and don't believe everything you read, on paper or on Internet. . It can biaised and absolutely not factual information solely looking to denigrate consciencious breeders, not to help buyers. I have lots of examples, as reference. At last resort, change breeds. All dogs are "nice", some don't have any grooming at all. And there are, as the French club spokesperson says, lots of Barbet bastards in pounds or SPA's that look like Briards or Griffon bastards or even dogs of my line and the advantage is that they are almost free. And to take that thought further, the Modern Barbet was re-incarnated with 2 "Barbet" type bastards called Lynx and Sérienoire. Found in a pound! At my house as like at others' concerned with their line, you will see Mom and Dad, Grand-Ma and Grand-Pa if they are still alive. Then you can see half brothers and half sisters, sons, daughters, aunts, uncles all living under the same roof in complete harmony, meaning they are not separated by walls or cages. A barbet is a family dog and does not live well outside or in cage, other than to sleep. You can see how they interract and how they look and feel and see if you sneeze or not ( anti- allergenic), and ask questions before you make a committment. What we stand for at "Authentic Barbet" "Old Barbet bloodlines", is the very thin thread that ties us to the past that exists and that we are trying very hard to keep alive. The one also called "Vieux Barbet Français". Any color...color being a link to the past!